Last night I got to share some ideas about being a billy goat in an internet filled with trolls. It was at the first ever VanTalks (video will be available soon). I shared (one of) the origins of the metaphor of a troll as a bully on the internet: the Norwegian fairy tale "The Three Billy Goats Gruff" in which a troll lives under a bridge and keeps the goats from grazing in a lush pasture. Right now it seems like the internet is filled with trolls, like there's no good comments section, like there isn't a place to have good conversations online. The way we can start to change that is by being the opposite of trolls. We need to be billy goats. Trolls are rude, abrasive, and abusive. Trolls are confident in what they know and cannot, will not be swayed from their certainty. Trolls are never, ever, ever wrong. It's nearly impossible to have a conversation with a troll and, what's worse, trolls often succeed in devolving the conversations around them. There might be good people trying to have a decent conversation, but in walks a troll and things fall apart. People start taking sides. It stops being a conversation and starts being a shouting match. I hate to say it. I don't want to be a downer. But the truth is we won't ever be rid of trolls. A medium like the internet that allows anyone anywhere anytime to share their thoughts will the world will, inevitably allow thoughts that are abusive, hurtful, and intransigent. Fighting the trolls, more often than not, won't do much of anything to help. Trolls love the conflict and won't be swayed by even the best of arguments. Trolls are here to stay. But they don't have to dominate the conversations. The reality is that trolls are the exception that is writing the rules. They are the tail that's wagging the dog. They are the minority influencing the majority. We can offer an alternative. We can offer a different way. We can be the billy goats to the trolls of the internet. Billy goats treat everyone with dignity and respect (even trolls). Billy goats seek to understand before they seek to be understood. 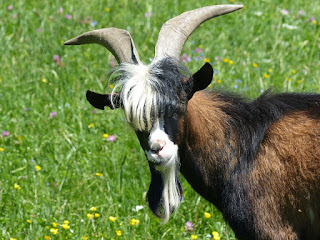 Billy goats willingly and graciously admit when they are wrong. If you want to start being a billy goat there's something you need to know. This isn't a short term engagement. This isn't something you can sign up for and knock out in a week. This will take time and commitment. It will take consistency and it will mean you are attacked by trolls. But it also means that you are stepping between the vulnerable and the trolls, that you are showing people a different way to interact online, that you are a part of a minority that is influencing the majority for good. C'mon, be a billy goat. Next up (next week) what this looks like in real life and some practical next-steps.